Sitting here I am thinking of what lies ahead for me in 2009. Will the economy come back around? Will my career take a turn I am not expecting? Will my wife and kids continue to drive me insane:) But I can’t really get to far ahead of myself without taking a quick look back at how 08 shaped up for me. Let’s start with the good things. My loving Wife – after 15 years of marriage she still puts up with my crap. My awesome kids – bringing constant enjoyment and chaos to my life (I wouldn’t have it any other way). Bella – added a new addition to the fam. A black lab puppy named Bella. Motley Crue/Saints of Los Angeles: It’s like they never went away. 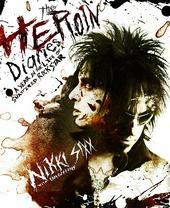 Oh yeah, I read Nikki Sixx‘s book “Heroin Diaries“. All I can say is WOW!! Slipknot/All Hope is Gone: So so effort I felt. Capitals: Caps winning the SE division and making the playoffs. Ovechkin winning a ton of NHL awards. Travel: I traveled to Chicago, Buffalo and to Bermuda. Need to travel more in 09. Gas prices – Seriously, $4 for gas? The recession – Great that the government finally admitted that we were in a recession. It only took them a year. Redskins – They started off great but ended the year in shambles. Looking ahead I can only wonder what’s going to come across my path. I hate to try and predict the future because that eliminates the surprise of life. I once heard that chaos is good. I could not agree more. Here to an unpredictable 09.